There will a few readings followed by Q & A and book signing. Copies of the book as well as beautiful greeting cards and a graphic poster created from the participants' quotes will be available for purchase**. *The Gallery space at the Alliance Francaise is not accessible. To Register: Click here to register. Space is limited to 40 people, and filling quickly. **Cash or personal cheque only, please. Acknowledge and celebrate what you've achieved and created, and who you are. Explore your beliefs, perceptions and attitudes about being 50. Discover what you're ready and not yet ready to let go of. Consciously create a vision and intention for your 50s. Engage in rich conversations about aging with like-minded women. Co-hosted by two certified life coaches, this workshop will pop the lid off this taboo subject! 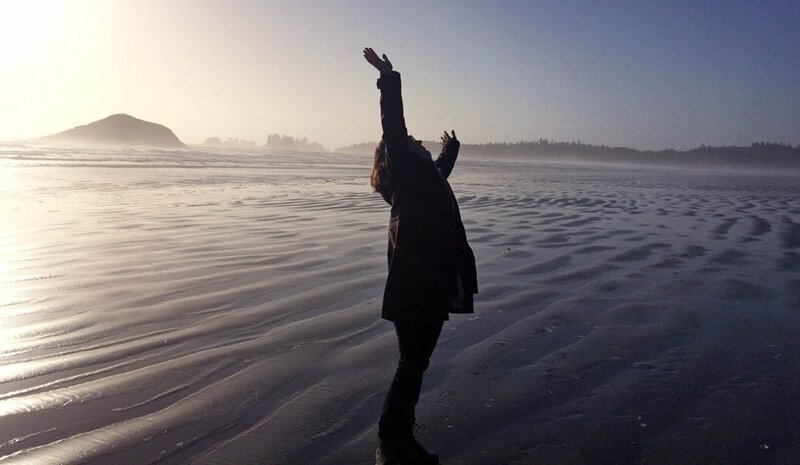 Through her workshops and one-on-one life and embodiment coaching, Allyson helps her clients reconnect to their unique voice and purpose. By reconnecting and attuning to the intelligence of their bodies they are able to find more clarity and comfort in the world. Allyson is also rapidly approaching this very milestone (Sept!) and is excited to explore this rich topic with a group of similarly-aged women. So much support, inspiration and motivation arises when we explore our selves together. Allyson is a Certified Professional Co-Active Coach as well as a certified facilitator of The Embodied Present Process. For a fuller bio, read more on her website here. Ruth Tamari is a certified life coach who has transitioned through her 50th and now finds herself in mid-life amidst entrepreneurship, caregiving, and peri-menopause. She worked as a geriatric clinician for 20 years prior to embarking on her own career change where she stepped into new roles as business owner, aging-in-place and positive aging consultant. She offers individual coaching, workshops and courses to people going through all types of transitions: life stage, residential, health, career/retirement, etc. With a M.Ed. in Counselling Psychology and Adult Education, she brings a curiosity about what contributes to our experience of health, well-being, aging and personal growth. Starting in 2010, Ruth began an interview project on “Our Thoughts on Aging” with adults of all ages. The book, The Invitation: Rich and Raw Conversations about Aging, Death & Dying will be published in Fall 2017. Are you retired or approaching retirement and wondering what’s next? During this 6-week interactive course, we will explore the retirement transition process including tools and strategies to help you navigate successfully. You will explore your personal beliefs and attitudes about work, leisure and retirement, and clarify what a fulfilling lifestyle means to you including your health, relationships, home and money. You will experience the power of visioning to create and realize new dreams and inspiring action steps. Participate in life long learning and personal growth. “This was a very unique topic, not found anywhere else. Hope that it will be offered again so other people can experience the same benefits as our group did. "Each week was a very pertinent, interesting topic that really caused me to re-think and appreciate my life." "It made me aware that I was not alone in looking to redesign my life." "Excellent and inspiring experience. I met a lot of very interesting people and I think I have made a few friends." "I wish this class could go on and on, and ..."
"I am very fortunate to have taken this course! I feel better prepared to face life's challenges." "The class will change you — you will start to recognize the person in the mirror." "I came to the class as a "facts and figures" person and I learned to move comfortably outside that and to think deeper." "I gained a clear path through the confusion I came with at the start of the class."